MyThemeShop Affiliate Program: Affiliate Marketing is the best and easiest ways to earn money online. Today I will share how you can make money through the MyThemeShop Affiliate Program. Let me tell you, MyThemeShop is WordPress themes and plugins market that offers free and premium WordPress themes and plugins. MyThemeShop is a web-based company that offers quality WordPress themes at an affordable cost. This business not only offers premium themes but also makes premium and free WordPress plugins that do good business to promote online. In addition to themes and plugins, it provides excellent support to its customers. To support dedicated customers, they support 24X7 online call centers.MyThemeShop is a high paid affiliate program for WordPress themes and plugins. They are serving 355,909 happy customers by this present moment. They are offering 109 premium themes and 27 plugins that made for the richness of your website. So I’ll assume that you are interested in making more money. Let me show you the benefits and review of MyThemeShop affiliate program so that you know how attractive it is. All plans of MyThemeShop are available for individuals and developers. In this article, we tell you how you sign up in the MyThemeShop affiliate program page and register yourself. When you submit your application, then the MyThemeShop support team will review your application before approving the account. When you get the approval from MyThemeShop team then you can easily access to promotional banners and referral link. You can straightaway start promoting MyThemeShop. I think that the MyThemeShop affiliate program is the best affiliate program. Because it is easy to get involved and it’s easy to promote. And it gives you a flat 70% commission of every sale you mentioned. If you are interested in blogging, then you can earn a good income by promoting this product. Therefore, I recommend that you join and start earning money from your blog. 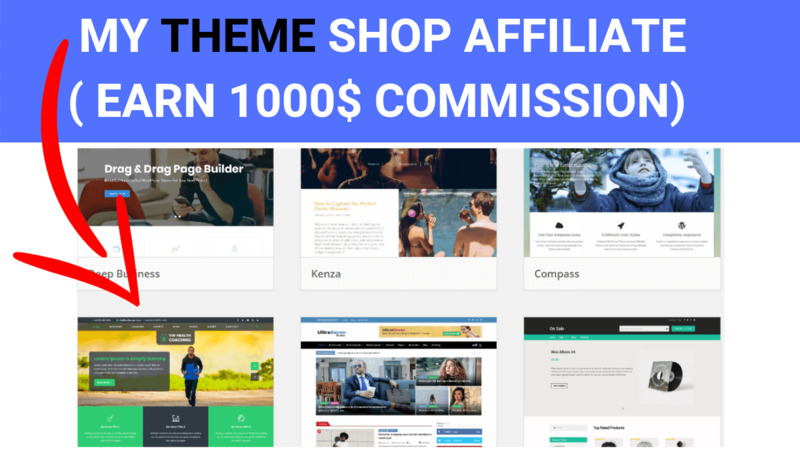 One of the main features of the MyThemeShop affiliate program is that they pay a very generous 70% commission and there is no limitation payment. Above all, there is no minimum payment limit. When you receive your commission in your affiliate account, you can get your payment. Compared to other theme providers, its high conversion rate is because all its topics are elegant, SEO friendly and affordable. Also, it also provides a return length of 60 days. If a visitor does not make a purchase on the same day but purchases the theme within 60 days, you will still receive a commission. Also, it will provide creative banners and promotional links. You can use these banners to attract your audience through advertising.MyThemeShop has the excellent ability to help you earn a good income from your blog. It was also the first affiliate program that I included from Blogger to WordPress after migration. Why you join the MyThemeShop Affiliate Program? 60 Days Cookie: It offers you 60-day cookie tracking. That means, supposes your reader clicks on your link today and purchases the theme within the next 60 days, and then you will get a commission. High Commission Rate: It provides the highest commission to its affiliates. You will get 70% commission for each sale you specify. More Than 80 PRODUCT: There are more than 80 themes and plugins in it. Therefore, it is effortless to choose good themes and plugins to promote. NO Limitation on PAYOUT: This is the best feature of this affiliate program because there is no minimum payment restriction. As we all know, many of the affiliate programs have limitations that when you reach the minimum limit, they give you money. But MyThemeShop has no minimum payment cost, and they send you the money you earn each month. Creative advertising banner: One thing I liked the most is its banner. They provide you with all sorts of responsive banners to increase your sales. Reference Other People and Earnings: MyThemeShop is a two-level affiliate program. You can refer others to join this affiliate program and earn 10% of their lifetime. Famous Brand: MyThemeShop is a famous and prestigious brand. So, you can quickly sell its product and earn a commission. If you are a new blogger, you cannot know how to sign-up in the MyThemeShop Affiliate Program. Then not worried, I will provide you an easy way to create an account on MyThemeShop affiliates. Step5: Now to your personal Email id and click on confirmation mail and then click on confirm. Step6: Now you see MyThemeShop dashboard with login detail like password and user id. Step8: After that add your PayPal email and save them. And now you are the part of MyThemeShop Affiliate Program. MyThemeShop Affiliate Program is the best way to earn money with affiliate marketers. If you have not involved yet, then you are missing a great source of earnings. Because of your little effort, it helps you make thousands of dollars every month. As we all know, themes and plugins are an essential part of any blog. Those who have started a blog should buy a theme for their blog. They provide over 80 high-quality themes and plugins to promote MyThemeShop. This site offers all types of themes for bloggers, businesses, and blogs. So, promoting these products on your blog and making money is very easy. MyThemeShop also supports a 2-level affiliate system that can be used to generate a passive income. For example, you can invite as many sub-affiliates and earn 10% of your earnings for a lifetime. If a sub-affiliate earns $1000 per month and you have such ten sub-related references, you will accrue $100 × 10 = $1000 in your account without a single conversion. So, If you have any question regarding Mythemeshop affiliate, feel free to ask in the comment section below. I would love to you sharing this article with your loving friends so that they can be inspired by this article and start affiliate marketing.